Description Welcome to TPL Trakker! TPL Trakker is Pakistan’s largest and the best vehicle tracking service provider. 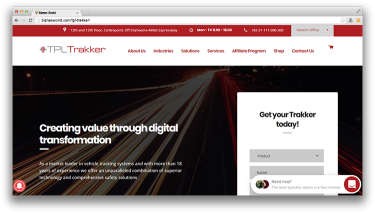 TPL Trakker offers gobs of tracking services which include vehicle tracking, Fleet Tracking, Goods Tracking, Personal Tracking, Container tracking, Remote monitoring and taxi solutions etc. TPL Trakker’s C-Track provides optimum car/vehicle tracking service through Pakistan. Address 12th and 13th Floor, Centrepoint, Off Shaheed-e-Millat Expressway.